Oregon has a strongly revered land use system, which began in the 1970s through a bi-partisan effort to think long-term about how Oregonians wanted their state to look. The response was a comprehensive land use system which prioritized protecting farmlands, forestlands, and open space. Also a priority was ensuring that when cities and towns inevitably grow, that they grow "smart", assessing transportation needs, affordable housing and other important issues that make communities great places to live. It also made citizen participation a big priority, making it "Goal 1" of the Land Use Goals. 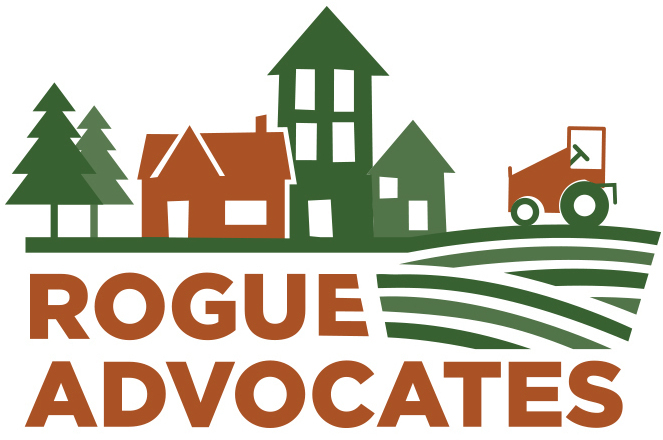 Rogue Advocates began as a response to Measure 37, a ballot initiative that authorized previously probihited urbanization of farmlands and other valuable resource lands in Oregon. We saw that Oregon's land use laws were being eroded, and that the Rogue Valley, with its explosive population growth, was especially in need of help to ensure that its rural character and vibrant communities stayed in tact. Fortunately, Measure 37 has now been repealed and no longer threatens valuable resource lands across Oregon. However, urbanization pressures have not gone away but are growing stronger all the time as the population continues to grow. The Rogue Valley has only a limited amount of arable farmland and other valuable resource lands and it is more important than ever that we make sure that we don't waste this land through inefficient urban planning. Rogue Advocates monitors the decision-making processes of both Jackson and Josephine counties' planning departments for any land use proposals that could have a damaging effect on the livability and sustainability of the Rogue Valley. We educate the public about any project that has the potential to negatively effect the quality of life in the Valley and reach out to Valley residents to encourage them to engage in the land use planning process, as state law authorizes and invites them to do. When necessary, we resort to litigation to make sure the counties comply with state law. The competition for land is fierce in the Rogue Valley, which has both a growing agricultural economy and a growing population.